You can say that Graph Paper Press came to be out of the lucky string of events. Thad Allender, a New York-based photographer, made websites for friends and organizations and he soon got tired of answering emails on how he did it. So he made his first template and the rest is history. But since 2007, when the Graph Paper Press was launched, passed over a decade, so has the beginner’s luck run out or not? Signing in can be done without purchasing any of their plans. They do have free themes, so to access them, you have to create an account. With some basic info and questions like do you already have a WP site, are you using WordPress.com or you are self-hosted and if you need a website or online store you will be logged into their dashboard. 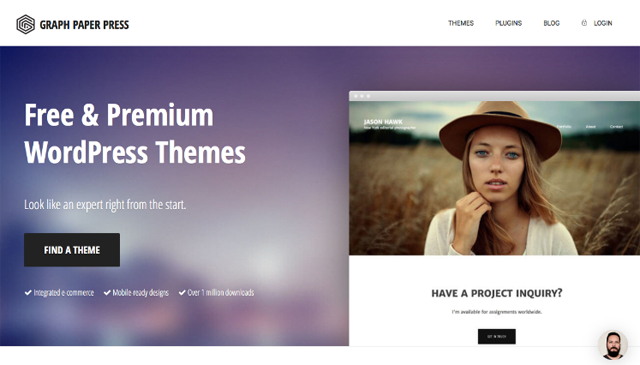 You will be ready to download free themes, but if you want to download premium themes, you will have to upgrade your account to one of their plans. 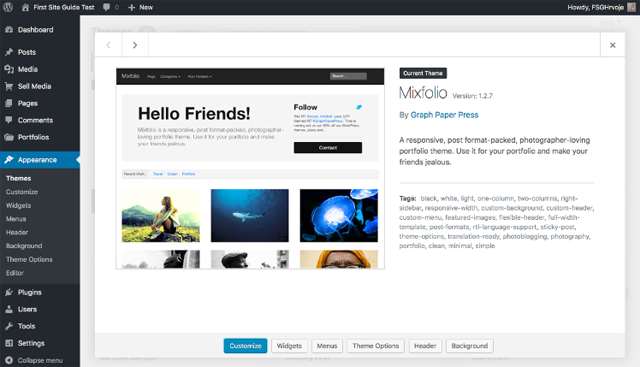 After you download one of their themes, and we picked Mixfolio, all you have to do is upload them in the .zip format at your WP site and you are ready to go. But beware, you will need a license key for updates and you will get that only with paid plan. So beware of that with free themes. To get it out of the way, Graph Paper Press is a club that is a bit more expensive than others. But unlike others, they have yearly and monthly subscriptions. Unfortunately, one thing that they do not have is the ability to buy one theme. We found that a little bit odd because not everyone is in need to have more than one theme. If you have simple needs for one website, this might seem like an overkill. They used to have that option but we are not sure why they canceled it. Their member’s area looks a bit different that you might expect, but that is a good thing. It is easy on the eyes and navigating it is a smooth like a sail on a day without a breeze. It is aesthetically pleasing and you can see that it all started as a simple, but effective service. But it’s not all just portfolios, if you are business savvy, they are also e-commerce conscious, so if it is virtual or real goods, you are covered. When it comes to builders, on the first glance, they don’t have it. But they launched Theme Works, which will help you build your own one-page scrolling website that will look quite modern. The only trick is that you will have to pay for it and it will depend on your needs, how much you will pay for it. 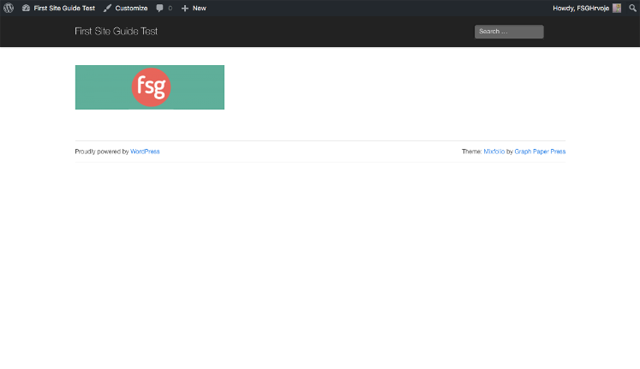 But with its simple drag and drop modules, you will be able to build a website within a minute, which is crazy simple. No disrespect to tech savvy grandmas, but everybody’s grandma that knows how to use a computer, would be able to build a website with Theme Works. However, it is a builder that will build just one type of website and that is not too versatile. Customizing their themes is a job that won’t give you too much space to wiggle and if you really want to make your theme unique, they will offer you services that are quite pricey. All in all, you win some, you loose some. Been unique was never an easy job. There are 69 themes that you can pick from. They are divided into categories that are expected for audio and visual artists. Sure, there are blog and business categories, but let’s be honest, Graph Paper Press knows that it is primary customers are media people and they excel at it. All of the themes are easy on the eyes, responsive and minimalistic. And if you need to showcase your photos first and foremost, we will highlight Widescreen and Sidewinder themes. 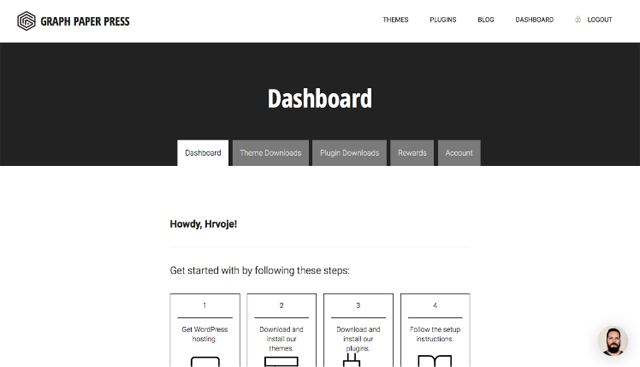 Some people might say that their designs are too simple with mostly black and grayscale, not as fancy or sophisticated like some other WP theme providers, but this it is not, ironically, about themes. It is about media that will be presented on your website and all media is best if it talks for itself, without many distractions. So in that area, they excel. And additionally, there are plugins that will nicely compliment your theme, so do not worry that things will get generic or bland. Because if they do, it is on you. When it comes to support, you will get your usual FAQ, tutorials, instructions and even the WP help, which is not often the case for theme providers. Ticketing system and social media is the way to contact their team, and there is live chat from within the site that will allow you to connect Monday through Friday 9am-5pm EST. Additionally, community forums used to be available only to paying customers, which is a bit weird, but even they are gone. Or we just couldn’t find them. But even without some things, support was adequate. There are three paid and one free account. With a free account, you will get access to their free themes. Professional plan will cost you $149/y. 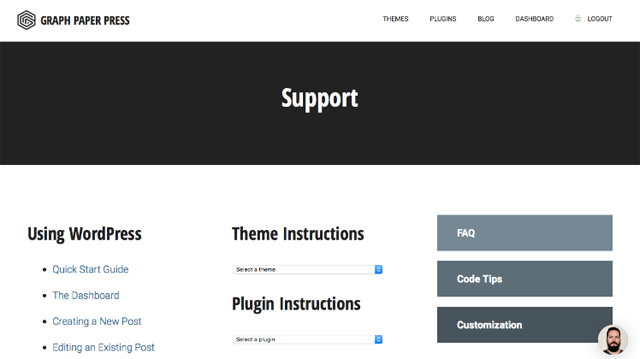 It will give you access to all themes and plugins, one website and updates. Lifetime plan will cost you one payment of $399. 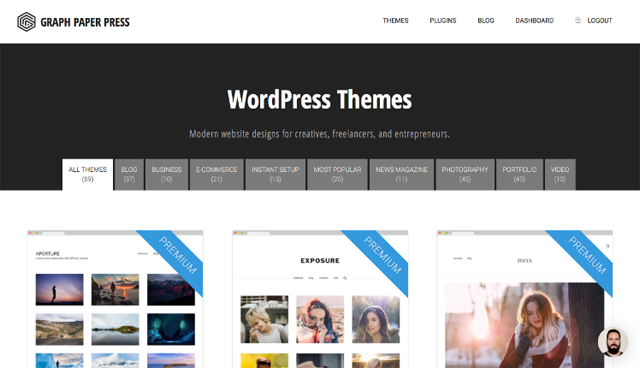 It will give you access to all current and future themes and plugins, unlimited websites, updates and 10 custom designs from Theme Works. Graph Paper Press is hinting at its core customers in its name. It is for people that are artists, mainly photographers that like simple yet elegant and minimalistic solution for their online portfolio. However, if you are struggling artist, their themes, or better to say club membership will be a little bit more pricey than the competitions. But since it was developed by a photographer, you won’t get any outdated or ugly themes and there are few freebies via themes and plugins. Just in case you need to start somewhere or see if it a match. Its themes will give an advantage to your content, so it is a great pick for a showcase of what you have. So, if you are a photographer or any other kind of media creative person, we warmly recommend you to try it out. Otherwise, you might find better-suited options.